Do you do cryptic crosswords? Ever attempt DA? Here’s a clue. 13 Across. “Young white knight, with an interesting surname, I hear”. 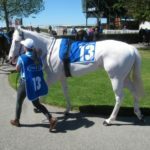 First up for my season are the two-year-olds, and I’m much tempted by the omen bet, Utzon, the much publicised albino. There’s a heap of people around her stall with raised iPhones. 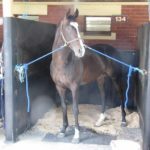 The filly seems reasonably relaxed with the two strappers but by the time she gets into the yard she starts to get her head up and fidgety. Favourite, at $1.60 the place? Overbet, as many striking horses are, and probably a lay. But I’m much taken by the relaxed Biscara. In the running Biscara dived for a run that wasn’t really there, got bumped sideways, but managed to recover and run on strongly for second at $2.80. Should have won, said the watcher, but happy with $2.80 first up in the new season. The white knight, Utzon, was a victim of the interference too, but couldn’t recover. And that’s it. I didn’t have another bet all day as I got my eye in. I saw two standouts, Sunlight and The Autumn Sun, and spent a lot of time out the back eyeing the Cup horses. I fell in love with two horses – Thecliffsofmoher (been there!) and Yucatan. Both horses were standing forward in their stall and not cringing in the back corner. 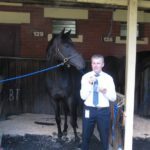 Thecliffsofmoher was nuzzling the strapper and trying to eat his lunch! The horse ran on very well for fourth despite getting very hot in the yard. Yucatan just looked imperious, and that’s how he won! Bring on the Cups! Q. Is looking half asleep necessarily a good sign? Q. So we can’t be critical of the strappers for engaging in other activities (reading, mobile phone)? Q. Should we therefore not automatically regard two strappers as a positive, it all depends upon how the horse is reacting to them. It’s not uncommon for two strappers to accompany a horse in the UK (in big races most horses have two strappers), sometimes the horse looks calm (and very occasionally might even prance), and at other times there are two strappers because the horse is showing signs of boiling over, or may have already done so. So I would imagine that context is all important when deciding whether two strappers is a positive or not. Q. Is looking half asleep necessarily a good sign? Yes! Relaxed horses rule! Q. So we can’t be critical of the strappers for engaging in other activities (reading, mobile phone)? No! Although I do mark horses down if the strapper is smoking or drinking beer. They are there to look after the horse’s welfare, not their own. But reading a book or looking at Facebook is fine, so long as the other eye is on the horse. Q. Should we therefore not automatically regard two strappers as a positive, it all depends upon how the horse is reacting to them. Yes! Two strappers in the parade ring or yard used to be a negative variable because the extra hand was only employed with unsettled horses. Now that it is common and used more universally it is a very positive variable. I suspect it is because the horse is a herd animal and two, even though they are humans, are better than one.